We're cleaning out the office and giving away more autographed CDs. Find out how to win now! 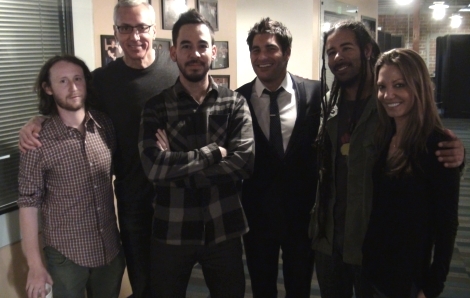 Mike Shinoda from Linkin Park joins us tonight to promote the band's 2011 World Tour. Check out this video promoting the upcoming tour. But that's probably because we had to shoot the video twice due to equipment failure. Mike really let one rip right as I was taking this photo. Chester, Brad and the guys discuss one of our callers and her affinity for man juice.